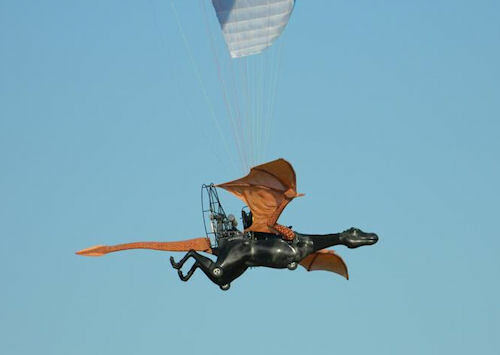 Weird Things » Blog Archive » Flying Dragon Spotted in California! Flying Dragon Spotted in California! 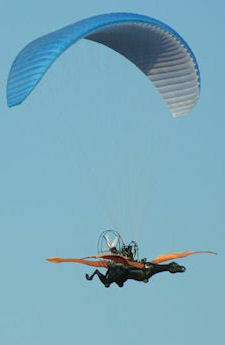 Several months ago, people had claimed to see flying humanoid figures in the skies. Most of the viral surge was from various consipiracy groups online. It turned out to be simple, flat, human-shaped RC planes. We have a feeling that same group is going to be salivating over stories about a flying dragon. 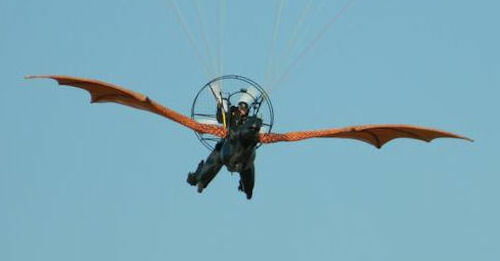 A flying dragon has been spotted in California at Minter Field Airport. Obvious from the image above is that it’s not a real dragon but a weird hybrid of a paraglider’s parachute, a swamp boat and a dragon. It’s like the much bigger, cooler brother of the R/C dragon we reported on a while back. According to a local newspaper near the airport where the dragon’s been spotted actually spitting fire, Disney Imagineers are the sorcerer’s behind this piece of awesome. Patents were filed earlier this year for the vehicle showing details but Disney is keeping very hush about whatever project the Imagineers are up to that would involve the need for a flying dragon. “I can’t really tell you much. So sorry,” Disney spokeswoman Angela Bliss said Thursday, confirming only that what people around the airport saw (she never used the word “dragon”) was a project of Glendale-based Walt Disney Imagineering. The Minter Field general manager won’t talk about the dragon based on a confidentiality agreement but that hasn’t stopped people from talking about the fabled creature buzzing the airfield. Pilot Patrick Wiens says he’d never seen anything like before. Neither had the people who’ve talked to him about it in casual conversation.